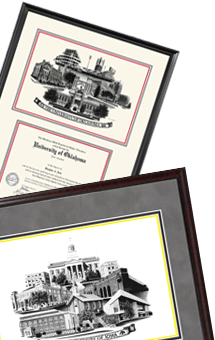 We offer many styles of diploma frames for over 30 universities. Begin by selecting your school on the left. Through close observation, I render my drawings as detailed and realistic as possible. I spend time on the campus, where I am inspired by the landmarks, traditions and emotions that are unique to each university. Like most artists, I have a vision of what I want to draw and must research, photograph and sketch until I have illustrated what I envision. Because of the detail that I try to achieve, my drawings can take up to three months to create. I hope I have been able to capture the essence of each university. Thank you for taking an interest in my artwork.